This LANMU wall vase,can be used to store office supplies and other small ornaments, as well as the wall planter.The wall mount multiple organizations in a group of attractive decorative wall. Size of the wall hanging flower vase: About 7.5"*4.5"*2.5"
Convenient,exquisite and utility, it's a good idea for your home or office. Handcrafted Wall Vase Holder: Made of high quality white ceramics and brass plated iron,characteristics of the corrosion resistance and durable,ideal for hanging plants or storage some other gadgets. 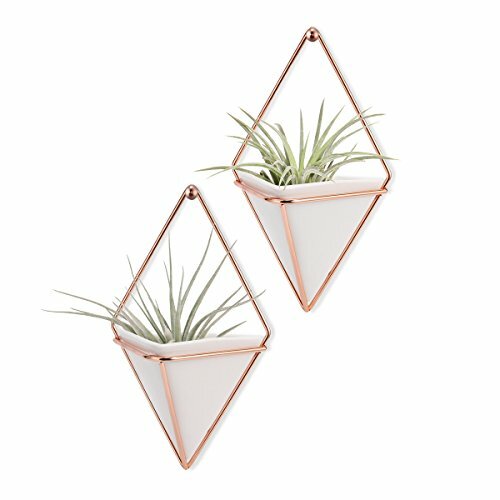 Special Geometrical Hanging Decor:unique geometrical and wall hanging design,you can use it to grow plants with elegant appearance,perefect home decoration for you or your family. Easy to install in a few minutes,mounting hardware and installation instructions are all included,you just need to drill hole in the wall then hang it on the wall with screw cap. Solid brass plated geometric stents and screws,can strong hang on the wall.The little screw comes with beautiful screw caps,it will be a surprise for you.